Happy New Year to Keswick and I hope your year begins with multiple good books to light your way! 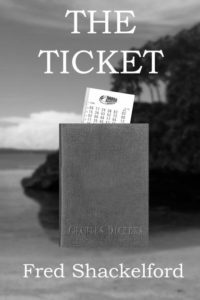 We are fortunate to have our very own Fred Shackelford releasing his new novel The Ticket and it’s a great way to start your year off right. Channing Booker has won the jackpot lottery and hidden the ticket in order to make sure he doesn’t have to share his winnings. This character is sleazy but amusing and it’s entertaining to watch him as he searches for the ticket that suddenly disappears along with the book it was tucked into. Filled with twists and turns, it’s a legal drama that will satisfy the suspense lover. Elizabeth Eaves has an insatiable hunger to travel the world. In Wanderlust:A Love Affair with Five Continents, Eaves covers fifteen years of her exploits as she traverses the globe. From London to Egypt, Paris to Karachi, if you have itchy feet like me, this book will make you long to book a plane ticket. Along the way you will discover how the authors love of travel and adventure is tangled up in her desire for different lovers. She seems to constantly be searching for some experience beyond her grasp and that propels her forward at every turn. If you want a book that changes her perspective on mental illness and leadership try Nassir Ghaemi’s A First Rate Madness. Ghaemi takes a look at why sometimes sanity is not always a plus when leading a country or corporation through tumultuous times. He covers famous historical leaders such as Churchill, Ghandi, Sherman, Ted Turner, and Kennedy in his attempt to illustrate his theories and I found it gave me a great deal to think about. It will certainly make you see that mental illness may not be a completely negative thing. There’s hope for me yet! So if you don’t have a New Years Resolution yet, try resolving to read more in 2017 and I hope to see you in the bookstore soon! The Virginia Festival of the Book announced recently the 2017 Festival headline events addressing Andrew Wyeth’s influence, real and imagined; family ties, to community and to murder; a realistic look at the state of the American economy, from past influencers to necessary changes; how failure influences science; diner food, traditional to modern; and odes to poets, ancient and contemporary. •Newbery Medalist Kwame Alexander, author of “The Crossover”, and Caldecott winner Ekua Holmes, illustrator of “Voice of Freedom”, will give presentations to local students in addition to a public program about their forthcoming collaboration, “Out of Wonder: Poems Celebrating Poets” (March 2017). Tickets for select events go on sale at VaBook.org on Thursday, September 15, 2016 at 9:00 a.m. Additional authors and events will be announced as they are confirmed.